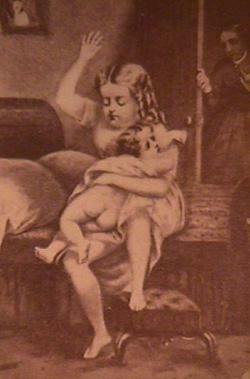 Vintage drawing of a girl spanking an infant sibling. A very young child (birth to 3 years) who has not fully mastered walking (includes toddlers). A very young mammal. eg "baby rabbits"
The youngest member of a group (not necessarily young). eg "the baby of the family"
An immature childish person. eg "stop being a baby!" A project of personal concern to someone. eg "this project is his baby"
A term of endearment for a girlfriend or boyfriend. Occasionally babies are given a single smack to get their attention, but it is rare for them to be given a spanking, particularly in recent times. Babies are totally dependent on others for their needs. Because of this, age players, in particular infantilists, can find such a role to be either a form of complete submission or, particularly when a person is forced or commanded to assume an baby like role, a source of major humiliation. This page was last edited on 19 September 2016, at 15:39.